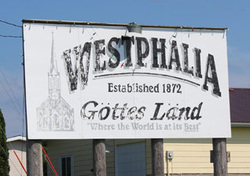 WESTPHALIA derives its name from the German province of Westphalia, and was a center of German Catholic settlement in the county in the 1870s. The village was platted by Emil Flusche, June 22, 1874. A post-office was established in 1875, with Joseph H. Kuhl as first postmaster. In 1991 the City was placed on the National Register of Historic Places. 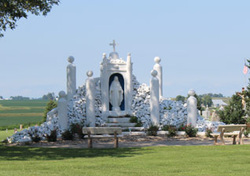 The historical district includes the Church, Rectory, Cemetery, School, Our Lady of Grace Shrine, St. Isadore (patron saint of farmers) Shrine, Ball Diamond, Clubhouse, and First Fruits (corn crib). The City also has one of Iowa's longest running amateur baseball teams. Shelby County schools are among the State’s leaders in combining a top-quality academic education, with a wide variety of successful extracurricular activities. Bill Stinn Masonry, Farm & Fun Repair, Hair Corner, J & D Storage, Jay’s Custom Woodworking, My Nest Greenhouse, Schechinger Feed Lots, Schechinger Seed, Shade Tree Repair, Tom’s Electric, Tom’s Repair, and Westphalia Club House. The workmen baked bricks for their church and forged the church’s first of two 2.5 ton bells that adorn the church. In 1991, the Church and the surrounding church property were placed on the National Register of Historic Places. Located on the east edge of Westphalia. It features a shelter house, playground, and many native prairie grasses and trees. Since 1882, a July 4th celebration to honor the church and community. Open every Thursday night May through November. 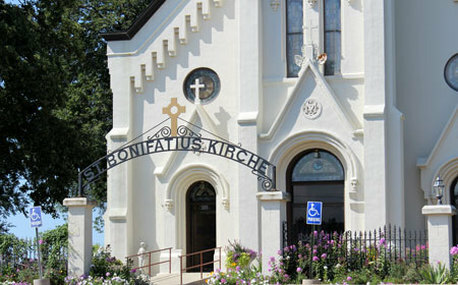 Built in 1872, it was the home of the first Catholic Mass, wedding, and baptism in Shelby County. The home later was relocated behind St. Boniface Catholic Church.